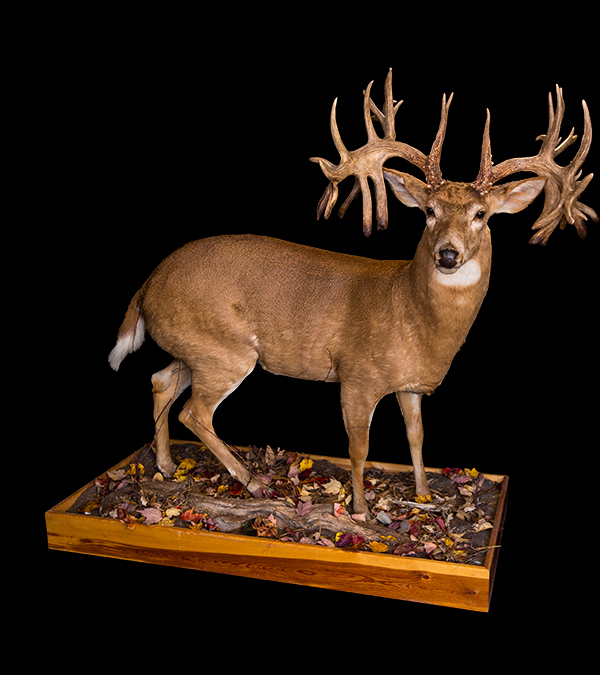 The Whitetails of North America Collection exceeds expectations! 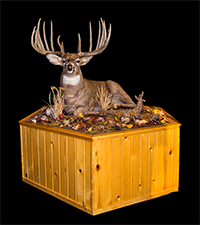 This collection includes full mounts of the current World Record Typical Whitetail, The Milo Hanson, and the current World Record Non-Typical Whitetail, The Missouri Monarch, as well as 8 of the top 12 Typical Whitetails, as scored by Boone & Crockett. 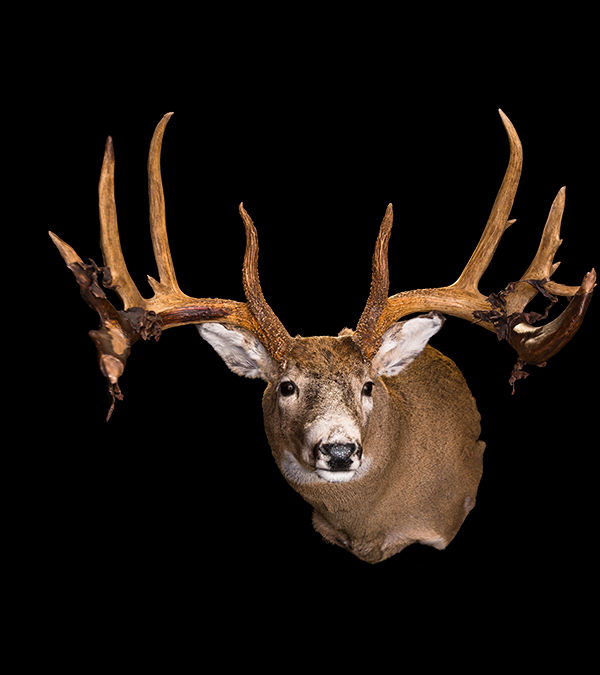 The Whitetails of North America Collection exceeds expectations! 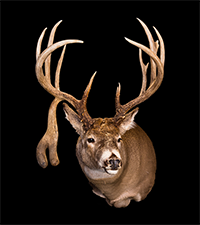 Below is just a small sample of this spectacular collection, which includes the current world record typical and world record non-typical full mounts. 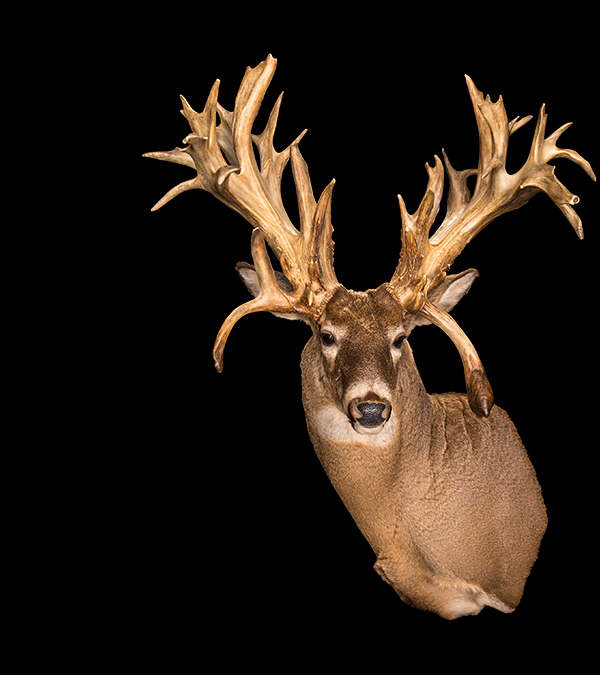 This amazing typical whitetail was shot with a Winchester, model 88 by Milo Hanson in November of 1993 in the farming community of Biggar, Saskatchewan. The Hanson replaced the James Jordan which was the record holder for approximately seventy-nine years. The Hanson is perhaps best known for its great symmetry, low amount of abnormal points and the length of its beams. Becoming the new record holder almost didn't happen as the bullet that brought the Hanson down is believed to have deflected from its ribcage, lodging into the back of its right beam. At that time, had the bullet broken the antler, the Hanson would not have been scorable. 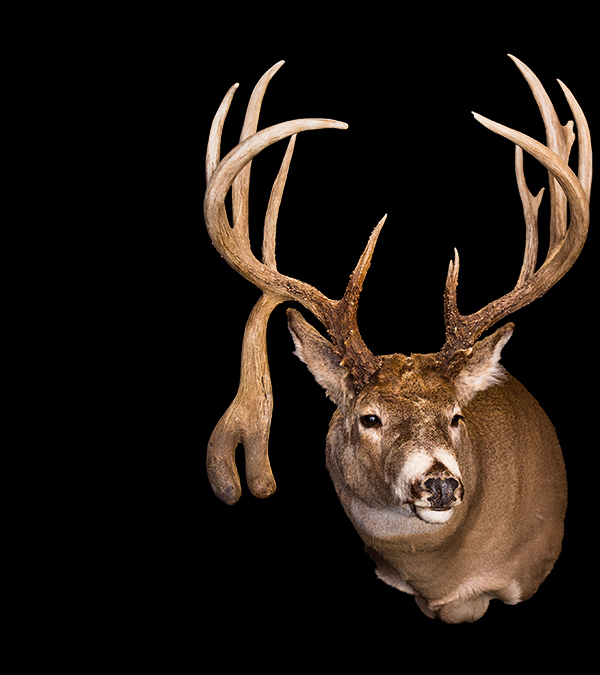 This remarkable Whitetail was found dead on the side of the road on November 15th, 1981 by hunter Dave Beckman 20 miles outside of St. Louis, MO. Beckman contacted Agent Mike Helland of the Missouri Dept. of Conservation and the MDOC claimed the dead deer. It was determined that the deer had no wounds and apparently died of natural causes. The Monarch was determined to be approximately four and one half years old and had a live weight of 250 pounds. The buck had a lower jaw deformity which may have been caused by a puncture wound to the lower jaw bone resulting in an infection and the loss of his lower incisors. Boone & Crockett Measurer Dean Murphy measured the main beams as 24 1/8 & 23 3/8. 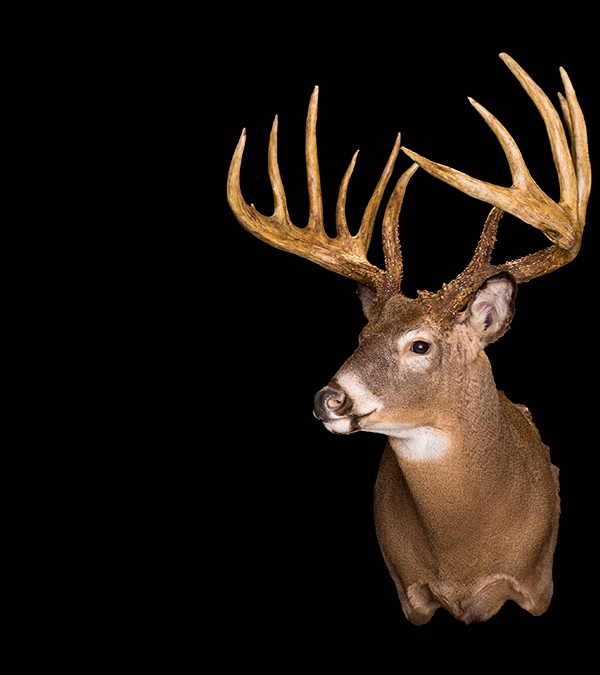 It was entered into the record books as “Deer not taken by hunter”, with 44 scorable points. 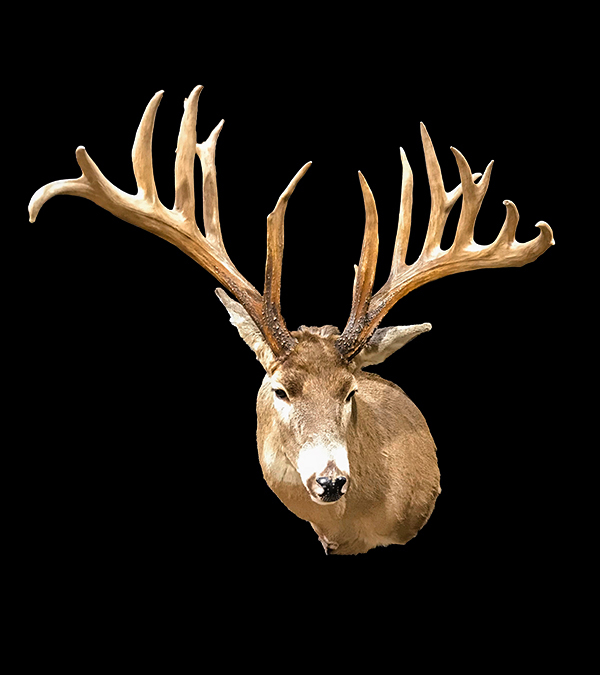 The original antlers were hung in The Jeffrey City Headquarters of Missouri Department of Conservation and are believed to be worth one million dollars. These Iowa sheds were known as the Knifehandle because it was believed that the left side of the sheds, which were missing for approximately 40 years, had been made into knifehandles. 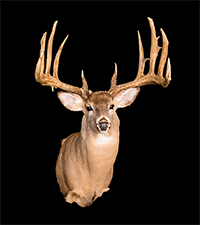 The sheds have 16 points on an 8 X 8 frame, an estimated spread of 21 7/8 and an estimated gross score of 238 0/8 inches. Shot in Northern Minnesota with a .30/30 rifle, the Breen was a big bodied, but old and thin buck and its meat described as not very tasty. 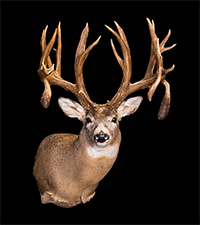 In the early 1950s, the Breen family decided to have the head officially measured by Boone & Crockett and it became the number one world record typical until the James Jordan Buck was recognized as the new number one typical in 1971. 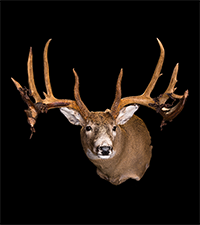 The Breen Buck remains a favorite of many Whitetail enthusiasts and holds the number ten spot with Boone & Crockett. 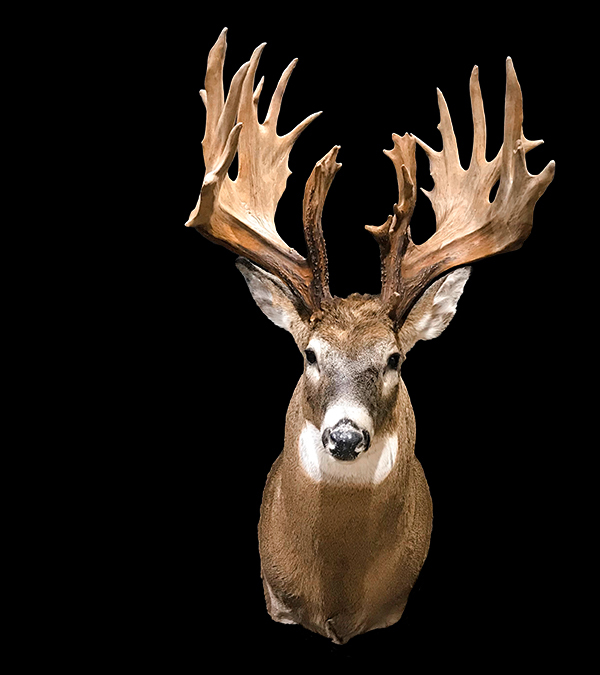 The Melvin Johnson is a spectacular buck and is the recipient of both the Ishi and Sagamore Hill awards by the Pope and Young and Boone & Crockett Clubs. It remains the archery world record typical taken with a 72-pound recurve bow. 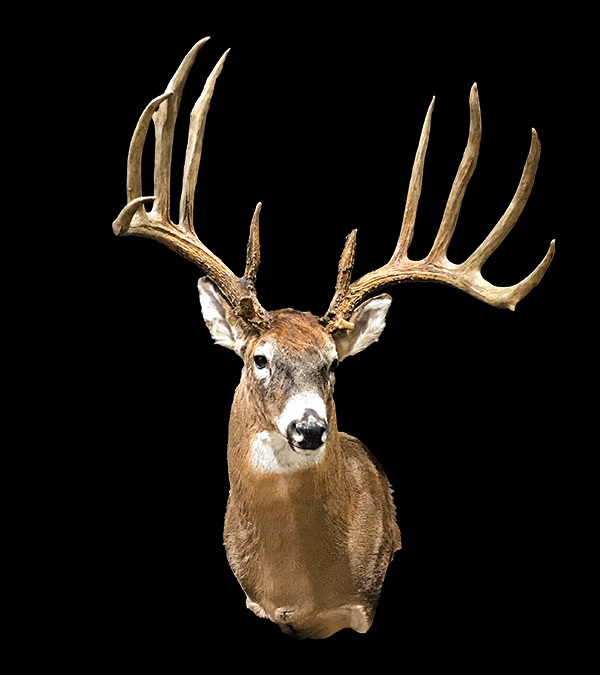 The Johnson's gross score was 211 6/8 inches and its net score is 204 4/8, with seven points on the right antler, six on the left antler and an inside spread of 23 5/8. It is estimated that its live weight was 340 pounds and it field dressed at 270 pounds. 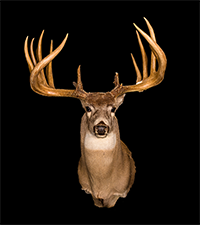 Considered by many to be one of the world's greatest typical whitetails, The Jordan Buck was the number one record holder for approximately seventy-nine years. First harvested in November of 1914 it was delivered to taxidermist George Van Castle for mounting. Unbeknownst to James, he moved to Minnesota and then Florida and James lost touch with him and his antlers. 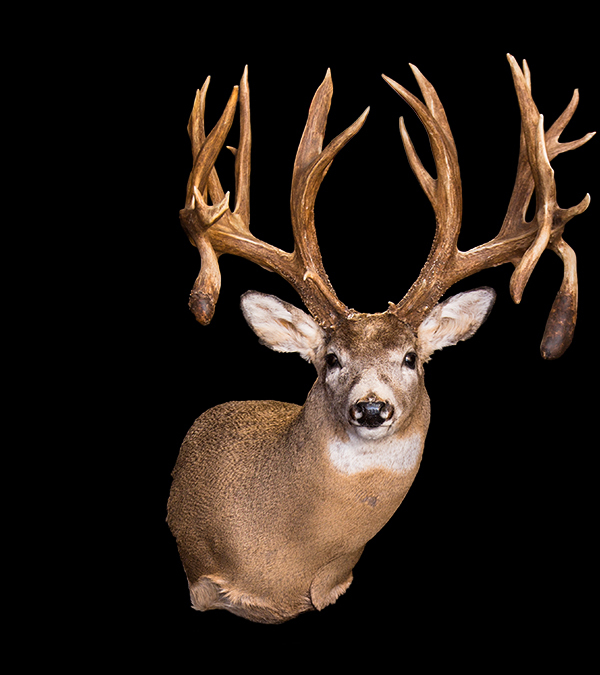 Through a curious twist of fate, a distant relative of James purchased the head in 1958 for $3.00 at a yard sale in Minnesota and had Boone and Crockett score it in 1964. When James visited him he recognized the head as his and began the arduous process of having it declared as his kill. 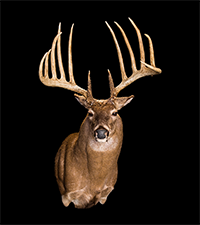 In 1971 it was remeasured and became the new world record and in 1978 James Jordan was declared the hunter. Tragically James had passed away two months before the announcement. 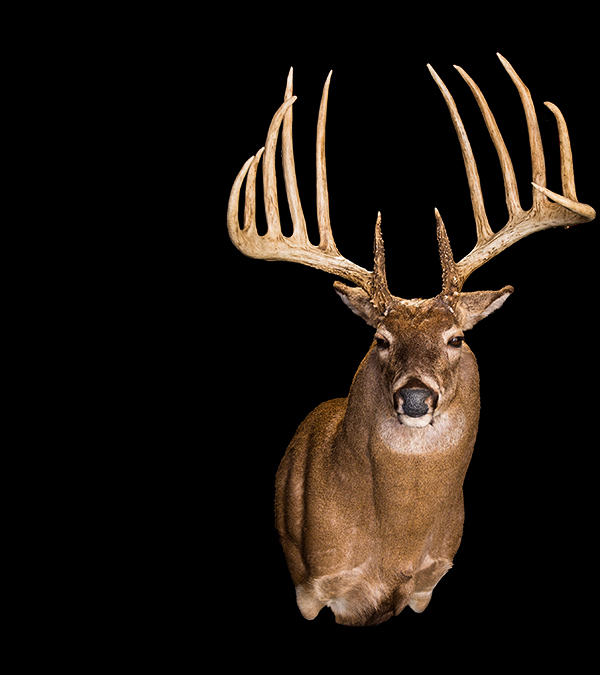 The Jordan Buck was subsequently replaced by the Milo Hanson in 1993, but will always be recognized as a legendary whitetail due to its incredible mass, symmetry and total lack of any abnormal points. 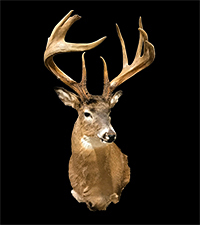 In 1992 the head was acquired by Larry Huffman, founder of Legendary Whitetails. 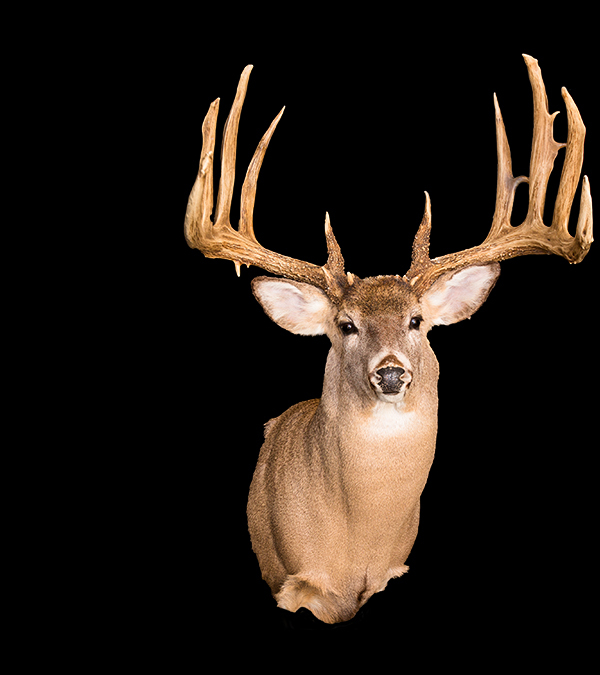 This whitetail is unique and a legendary whitetail for a number of reasons, one being the fact that it was brought down by two hunters, Maurice Berezowski and his friend, John Tarala, shooting simultaneously with both bullets connecting. 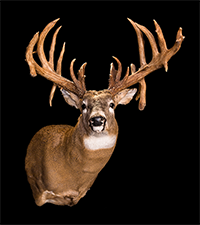 Secondly, it is also unique in that its antlers netted more than 200 typical Boone & Crockett inches and also scored 231 2/8 non-typical inches, which allowed the hunters to choose which category they would like to enter it into. 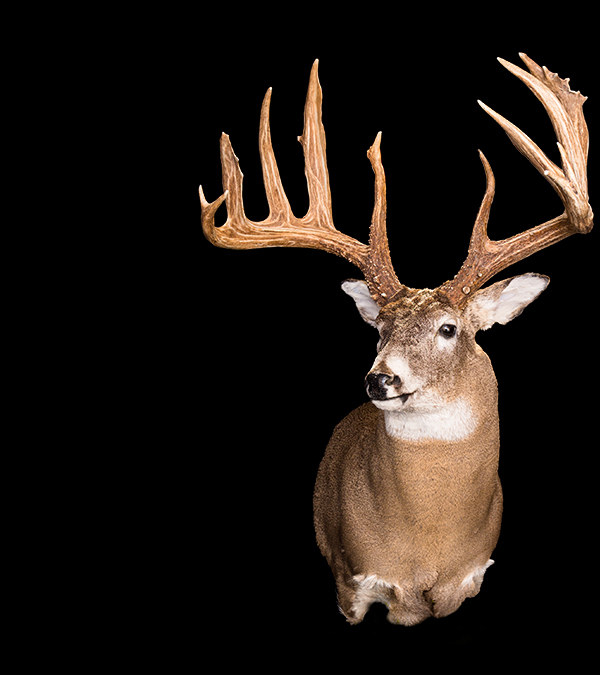 The 17-point main-frame 6x6 is currently the fourth-largest typical Boone & Crockett in Saskatchewan and holds the number nine spot under Boone & Crockett typicals. 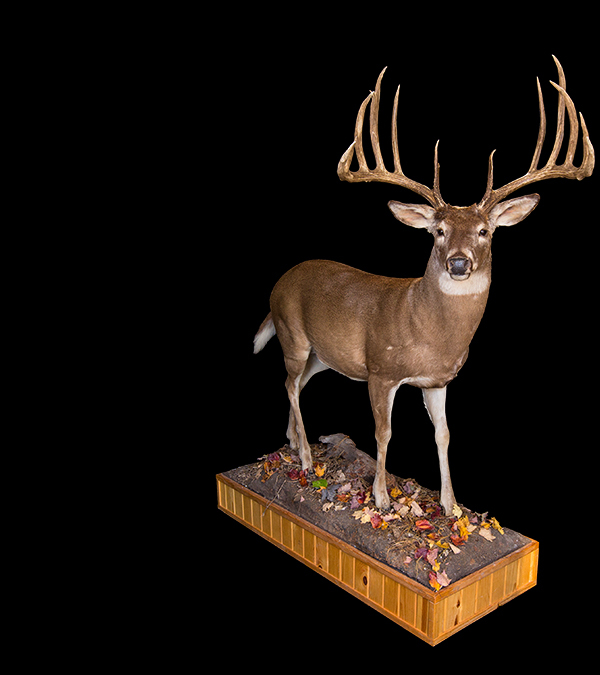 This Brad Jerman buck is an award-winning crossbow buck. 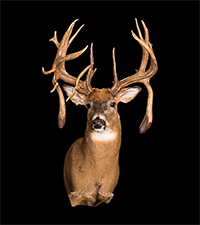 It received the World Record Crossbow Typical by the Safari Club International Records; the State of Ohio Record Typical Crossbow; as well as being awarded a Buckmaster Trophy Record (perfect) with 183 7/8. 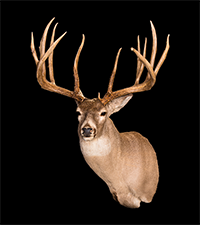 It is also ranked 11th with Boone & Crockett and is the largest Typical Whitetail ever taken with a crossbow. 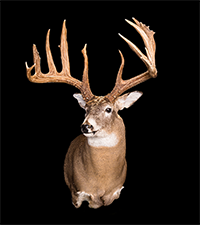 The Brad Jerman 5 X 5, with an outside spread of 28 inches and an inside spread of 24 1/8 is one of the greatest Whitetail Typicals ever taken by a hunter. At the age of 17, Neil Morin, an Alberta farm boy used his 300 Winchester Mag. at 30 yards to take this Whitetail with the second shot. 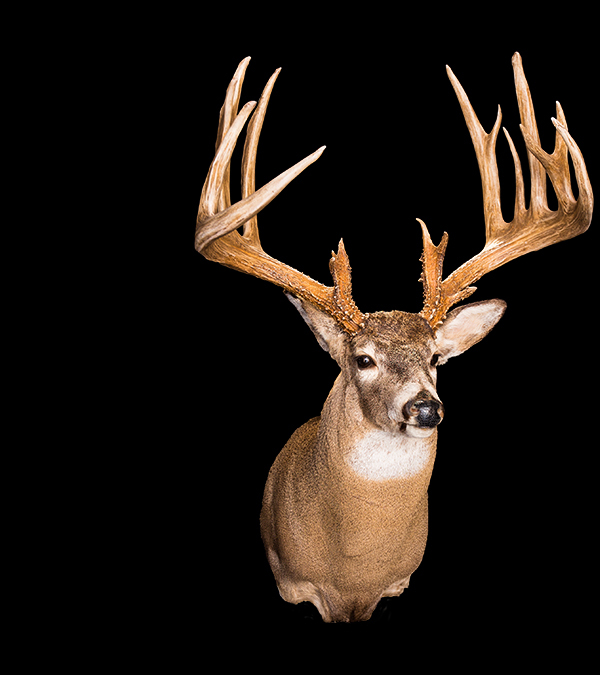 This Whitetail ranks as the 15th largest Non-Typical by Boone & Crockett and number one Non-Typical in Canada. Wayne Bills was new to hunting and had never shot a deer. He was invited by friends to take part in a group hunt. He shot the buck with a shotgun at a considerable distance, but it went down. A second shot was necessary but ended the hunt. In 1991 the antlers were acquired by collector Larry Huffman, who had them measured by Dave Boland of Boone & Crockett, who gave it an entry score of 201 4/8 typical points as a 5X5 typical despite the fact that the left brow tine had a large piece missing off the end of it. It was also scored about twenty years after it was harvested, which probably resulted in a lower score due to shrinkage. 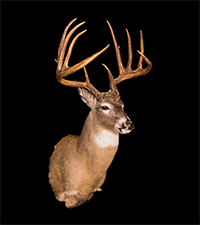 A striking Whitetail, the Knisley is a 13-point Typical with an inside spread of 25 3/8 and a gross score of 205 7/8 with deductions of 22 3/8, primarily due to lack of symmetry. The Knisley was taken on Ben Knisley's father's land from a tree stand with a .54 caliber Hawken muzzleloader with three shots. 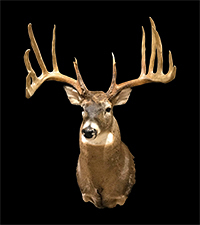 The buck was measured by Jack Comp for Buckmasters and by Dave Boland for Boone & Crockett. 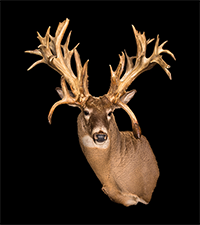 With its main beams and great mass it surpasses many record bucks. In Buckmaster antler classifications it is considered to be a semi-irregular, with only 6.1 percent irregular points. 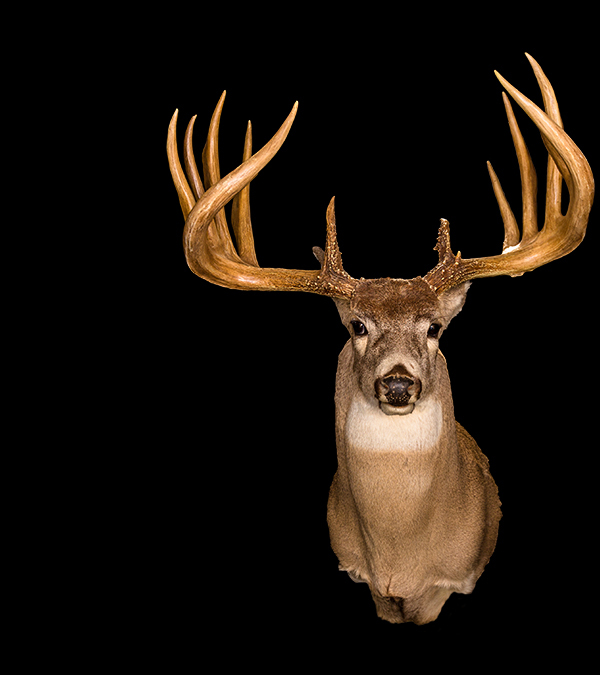 This buck was also chosen as the 2008 recipient of the Golden Laurel Citation, which is awarded to the most significant entry into Buckmaster's Whitetail Trophy Records. The antlers and skull of the Lobster Claw were found by a fifteen-year-old teenager in a dry pond in a slough in Avon, Illinois. Its main characteristic was a long 13 7/8 drop tine in the shape of a lobster claw on the right main beam. Found in the middle of November it is believed that there was a high possibility that this buck was mortally wounded during the firearm season and it eluded its hunter before it expired in the pond. 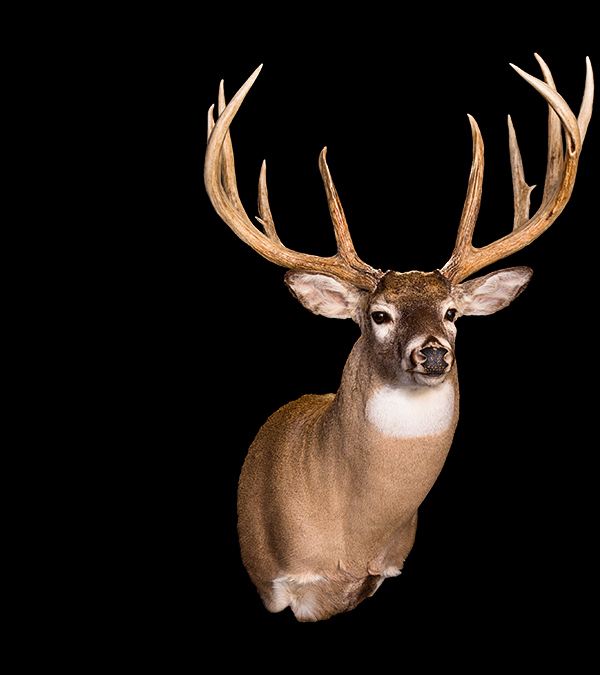 Harvested in 1971 with an 83-yard shot with a 20 gauge smooth bore shotgun, this whitetail is ranked overall number 3 by Buckeye Big Buck Club of Ohio. 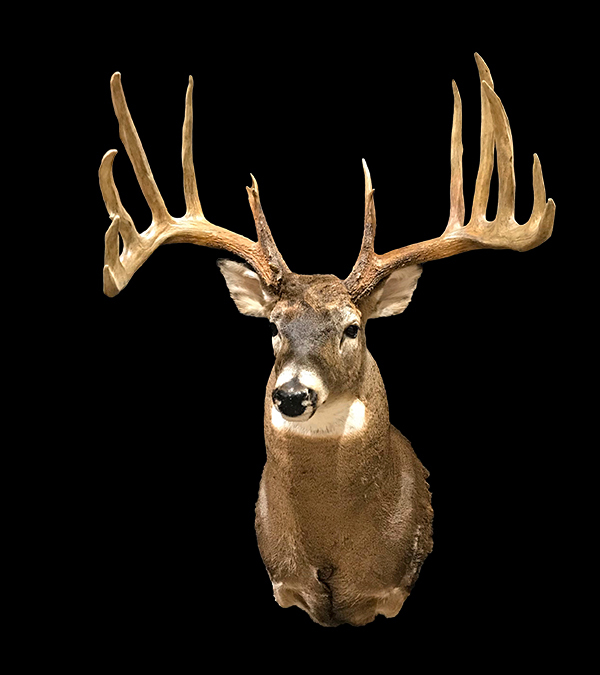 These terrific Whitetail sheds which were found by a Kansas rancher are one of the most impressive typical sheds ever found, with main beams averaging 27 6/8 inches and G2s exceeding 14 inches. The Red Wing buck was shot by Kenneth Kalien with his Remington Shotgun 870 with a 30-inch barrel and full choke, using 2 ¾ inch 12 gauge Remington slugs. He was hunting on family land and harvested this deer in the first hour of the season. 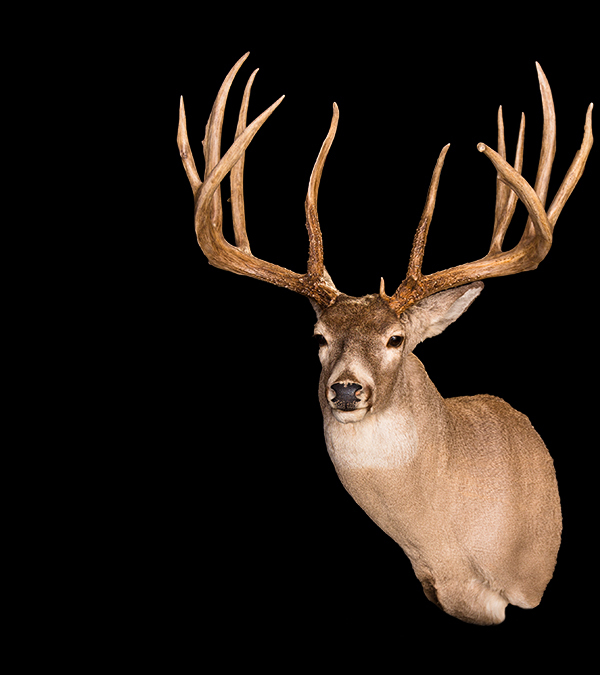 The buck could be described as basically a ten pointer with 27 inches of abnormal points. It has main beams of 30 5/8 and 29 4/8 and G-2s and G-3s over 12 inches long and an inside spread of 23 5/8. 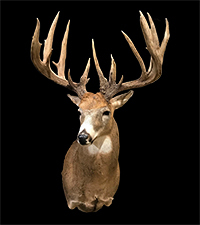 This buck was acquired by antler collector Chuck Arnold who had it scored. 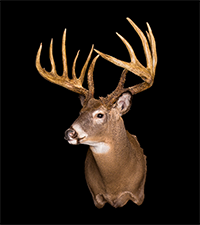 Its net score of 212 0/8 would have surpassed the James Jordan’s score of 206 1/8, but photos of the buck showing two sticker points surfaced before it was announced as the new world record. The photos showed that apparently two abnormal points had been removed to increase its typical score, which disqualified it from ever being entered into the record books. This is unfortunate as it is a very impressive typical. 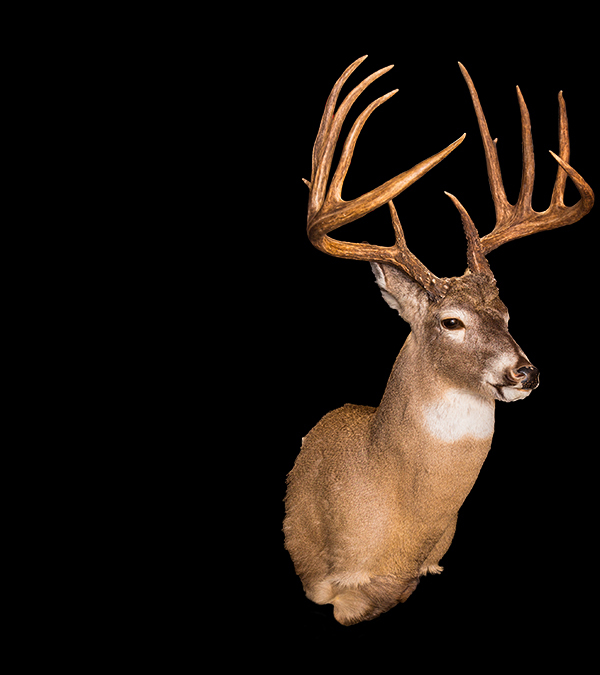 Also known as The Kentucky # 1, this buck was harvested with a rifle and weighed over 245 pounds field dressed. 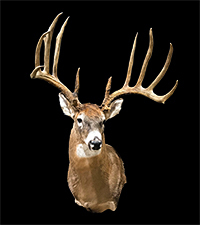 It is ranked as number 5 in the Boone & Crockett top ten Typical Whitetails and the number one in Kentucky by firearm. It has main beams of approximately 30 inches and an inside spread of 20 4/8 inches, with a 5X5 frame and was scored as a ten point typical. The John King buck was shot on November 18, 2006, with a Savage .30-30 bolt-action rifle in Grant County during a family deer drive. John King's cousin Brad Heisz fired the final shot. One of John King's shots had hit the left main beam of the buck, splintering the antler downward. 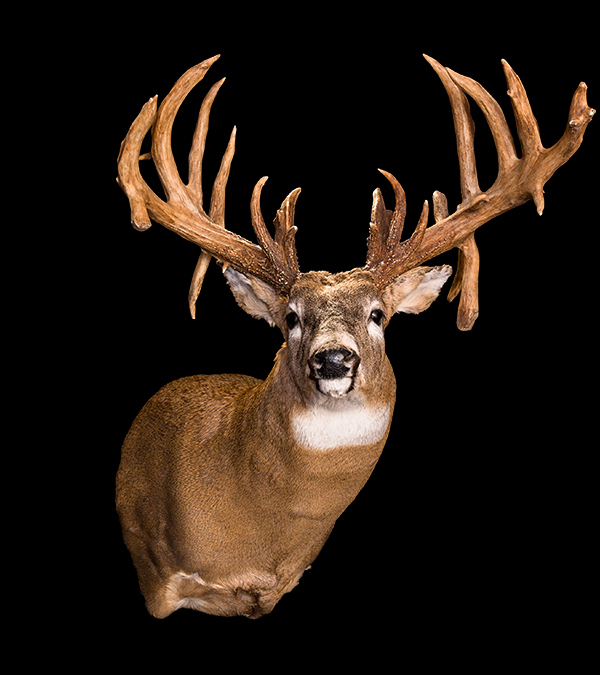 Due to the change of rules by Boone & Crockett, the head was accepted for scoring and entry into the record books, despite the damage to the antler. The head was examined and measured in Pennsylvania by Jack Reneau of Boone & Crockett who determined the right G-3 was an abnormal point, meaning the rack had to be scored as a mainframe 5X5 with two abnormal points, not a 6 X 6 with no abnormal points. This lowered the score to 180 1/8 typical points. Subsequently, Pope & Young and measurers of Boone & Crockett examined the head and disagreed with Reneau's findings. 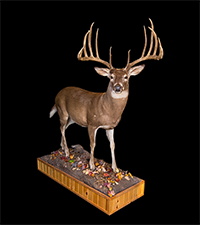 Buckmasters Trophy Records scored the head at 198 2/8 finding no abnormal points. 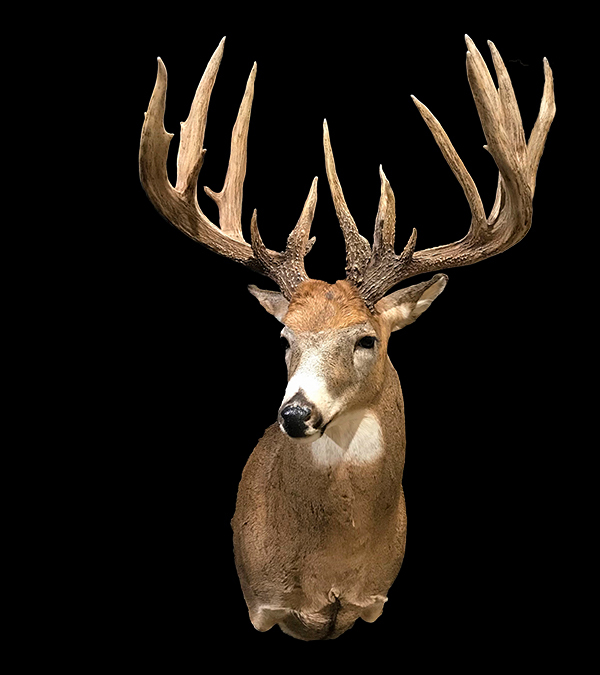 In 2009 John King sold the head to collector Jay Fish and in 2010 Boone & Crockett measurer Ron Boucher measured the head at 213 6/8, but this score was rejected by Jack Reneau. The John King fate is now in the hands of the Federal Court where the matter is pending. 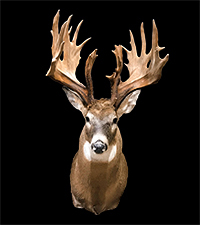 A remarkable set of antlers from a Missouri breeder buck that has it all, mass, points and drop tines! These spectacular world record sheds were in discovered by outfitter Tim Condit of Oklahoma in a Nebraska rancher's farmhouse. The Nebraska deer herd was nearly decimated by settlers in the 1800s and so Nebraska did not have a deer season until the fall of 1958. As a result, the herd had made a good recovery and it was not uncommon to find big sheds. In 1959 Conduit was looking for property to lease for his outfitting business and he was referred to individuals known to have big Whitetails. In this process, he found the General. It had a 6X6 frame, with 32 inch main beams and tallied an estimated net score of 218 1/8. With an estimated inside spread of 23 6/8 the General's gross score would have been 222 3/8. 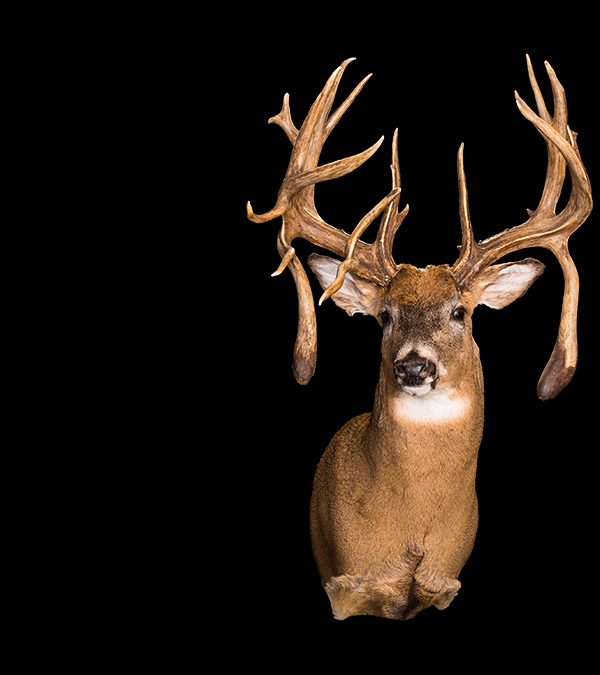 Most people feel this spread is too conservative and that with the probable amount of shrinkage the antlers experienced that the General would have been the biggest Whitetail deer to have ever walked the face of the Earth. The Kirk Gott holds the Ohio state record for Non-Typical crossbow. It was taken with a Horton crossbow, with the broadhead severing the femoral artery. Its BTR score is 260 1/8, which includes the inside spread of 21 4/8 inches. Harvested by farmer Edmund Kopp near Amaranth, Manitoba and known for its remarkable palmated tines. 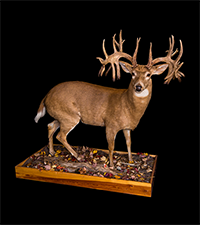 The Whitetails of North America Collection created by John LaBerge of Vergennes, Vermont is a world leading, mint-condition, round up. The collection’s crown jewels include the current world record typical and world record non-typical full mounts. 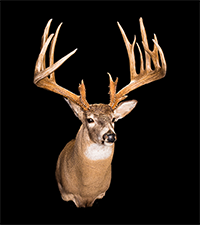 These are flanked by spectacular whitetail typical and non-typical giants, all of which have incredible and in some cases controversial histories. This collection made its debut at the 23rd Annual Yankee Sportsman’s Classic Show held in Essex Jct., Vermont, where it received a very enthusiastic response by show attendees. John LaBerge began hunting at age eleven learning the ways of the woods from his father and mentor Lionel LaBerge. Since then, John has hunted all over the United States and Canada taking many spectacular whitetails of his own. 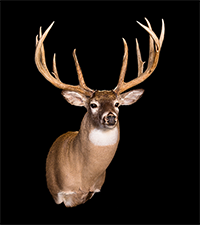 He has recently turned his attention to teaching his grandchildren how to hunt for trophy whitetails as well. John has a community-driven passion for the sport. Twenty-three years ago, sitting around the deer camp dinner table, John and his hunting partners bounced around the idea of starting a hunting and fishing exposition. They wanted to create an event that would celebrate our hunting and angling, not only for the most serious sportsmen, but everyone that takes to the woods and their friends and family. The Yankee Sportsman’s Classic was born in a tennis court. Today the show overflows the 100,000 square feet of the Champlain Valley exposition, Vermont’s biggest event venue. 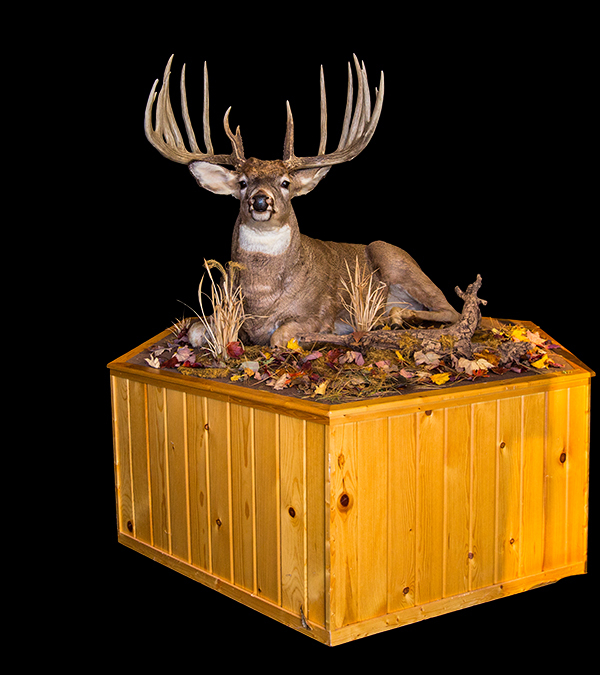 In 2014, when the Classic was unable to book a new notable whitetail collection, John decided to create one of his own. 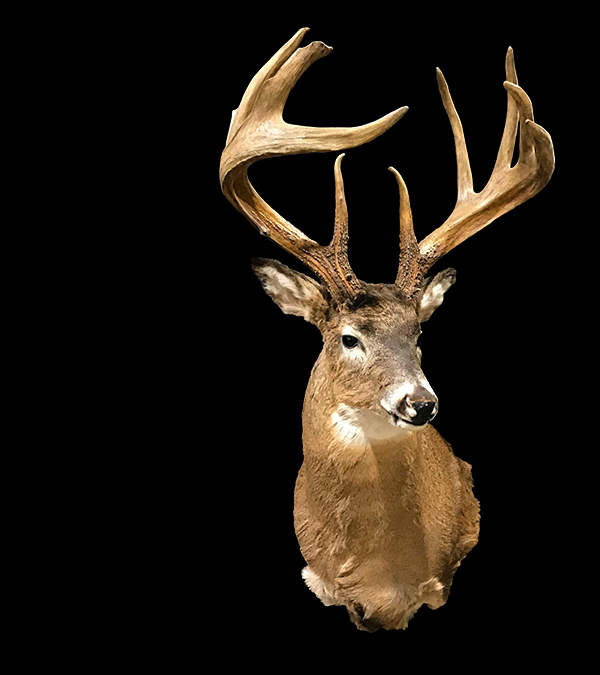 With the assistance of an expert collector, John exceeded his own expectations and assembled this unmatched collection of trophy and world record whitetail replica bucks.